Caption slip reads: "Photographer: Swaim. Date: 1960-06-01. Reporter: Swaim. Assigmment: Sweepstake winner. $56,000 sweepstake winner, Altadena. 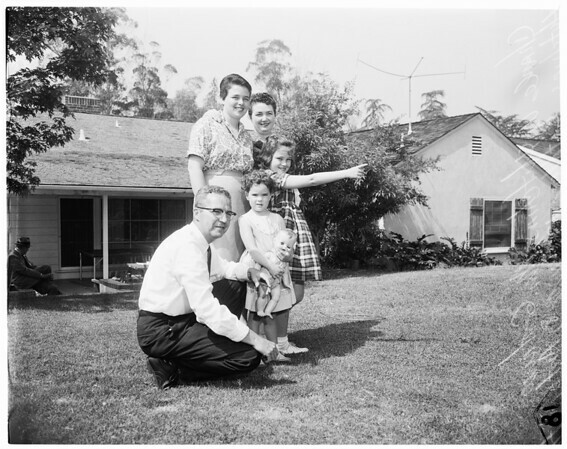 17-18: Charles W. Hutchins, 47, and his family, Mrs. Gertrude Hutchins (right), and Kathleen, 17, Linda, 8, and Antoinette, 4, pointing out where they will put swim pool if they have left from paying bills and setting up education for children."